Researchers at Georgia Institute of Technology and Emory University in Atlanta, and Vanderbilt University in Nashville devised a method with advanced microscopy to follow the process of viral infections without affecting the virus or its host. The team led by Georgia Tech biomedical engineering professor Philip Santangelo appeared online yesterday in the journal ACS Nano (paid subscription required). The research team employed a technique known as direct stochastic optical reconstruction microscopy or dSTORM that provides color and three-dimensional imaging to a resolution of 20 nanometers. For this study, the team used a device from Vutara Inc. in Salt Lake City. Santangelo and colleagues studied the structure of human respiratory syncytial virus particles as they infect living cells. Respiratory syncytial virus affects mainly infants, and is the most common cause of bronchitis and pneumonia in children under 1 year of age in the U.S. This virus, say the researchers, can be difficult to study, because it can take multiple forms and has a disordered structure. The respiratory syncytial virus also uses ribonucleic acid or RNA as its viral material to infect healthy host cells, which adds to the complexity because the virus can insert RNA at more than one point in the host cell. The RNA, however, provided the vehicle for tracking the viruses as they infect the hosts. 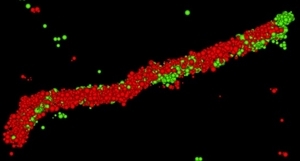 The team adapted a technique that attaches fluorescent chemical probes to RNA in cells. The technique combines short DNA and RNA strands with the fluorescent chemicals to become a protein that binds to the nucleic acid molecules. The double-genetic nature of the chemical compound, say the researchers, makes it possible for the probes to evade the cells’ defenses. With these fluorescent markers, the researchers could use a super high-resolution microscope to track and measure the infection in progress. The researchers were able to capture and measure activity of individual viral particles during the initial infections and replication of viruses within individual cells over an eight hour period. The team had another challenge in following the infection process: living cells move around. A Georgia Tech colleague, Thomas Barker, devised a technique with fibronectin, a protein that binds cell surfaces including those on DNA, to keep the cells being tracked within a 50 micron range — one micron equals one millionth of a meter.